A Burmese court has rejected an appeal by pro-democracy leader Aung San Suu Kyi against her extended detention, officials say. Ms Suu Kyi was found guilty in August of violating the terms of her house arrest after a US man swam uninvited to her lakeside home. She was sentenced to 18 months' further house arrest, which will keep her out of elections scheduled for next year. 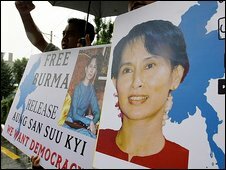 Ms Suu Kyi has already spent 14 of the past 20 years in detention. "The appeal was rejected but we will take it to the high court," her lawyer, Nyan Win, said after the hearing. Aung San Suu Kyi's National League for Democracy won the country's last elections in 1990 but was never allowed to take power. The court ruling comes days after the US said it would pursue greater engagement with Burma's generals in a bid to advance democratic reform there.